I am unsure what I think of Impetus. Jennifer Alleyn‘s merging of documentary and fiction is as beautifully made as you will ever see. It is haunting and ethereal in exactly the right way. I love the way it looks and the way it feels—and I have no idea what I am supposed to get out of it. As much as I love much of the film I really don’t know what I am supposed to feel about it. The film charts Alleyn‘s dealing with the leaving of her significant other which sends her spiraling down and beginning work on a film. As she deals with the ups and downs with her life she tries to get her film made, which becomes complicated as actors come and go and return looking differently making adjustments necessary. We watch the shooting of the film, completed sequences, interviews of friends and random images she hopes to include in the film. Half way into the film I was enjoying what I was seeing but nothing was hanging together. What exactly was the meaning? I didn’t know. I suspect that there are those who like ambiguous arty films will tell me exactly what I’m missing, but for right now I’m still not sure what I think. 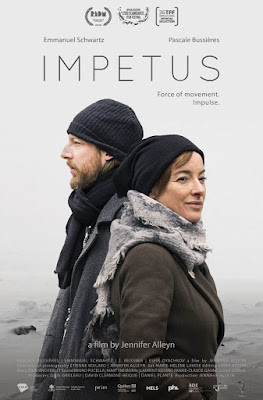 If you like beautiful films that break classifications and unique then make sure to see IMPETUS when it plays at Slamdance.